So, what is up with runner’s guilt? I was not sure if this was a real thing when it popped into my head this morning as I was driving to work. But later in the day, I googled it and it is in fact a real thing. And I am suffering from it. Which stinks. In my mind there are two types of runner’s guilt out there (well, there could be more – but in my head these are probably the most common, but of course I am not an expert). Type 1. You feel guilty for the time running takes away from other things in your life, like your family, friends, etc. [Occasionally I will suffer from this kind of runner’s guilt.] I think that this is the most common type of runner’s guilt, at least by what I have found on line. This is especially common with those training for marathons and half marathons because distance running takes a long time. My long runs will take at least two hours out of my normal day. Tack on a shower, stretching, icing and foam rolling and that is easily another hour. It is a big time commitment and if you are training for long races it is something that you have to do (and you want to do) on a regular basis. Most of the time I am perfectly ok dedicating a big part of my day towards a run or a long run. Running is a priority in my life, and thus I budget the time for it. I am lucky that most of my family and friends understand this about me. Type 2. Runner’s guilt when you are not running. This is what I was dealing with yesterday and today. Yesterday I had planned to go running after work. But I had a very long and somewhat stressful day at the office, and our house guests were only here for one more day. I did not want to take two hours after getting home at 4:45 to go running. I wanted to spend time with my family, enjoy the company and make dinner for everyone. I opted not to run. This morning I woke up feeling horribly guilty for taking an unscheduled day off. I hate that feeling. It was compounded by my drive to work this morning as I saw people out there getting their run on. Some were pushing Bob baby runners, others were just out there on their own running and some were running in small groups. I definitely had a pang in my stomach as I was driving in the car to work. I wanted to be out there, too. Anyhow. Runner’s guilt stinks. But sometimes you just have to do what you have to do and you have to make your choices and live with them. My evening last night was really fun, and totally worth it. I will get back on track with my training today and over the weekend. Breakfast this morning was sort of on the go – but it was really good. I packed a piece of 12 grain bread, a tablespoon of peanut butter and a banana. 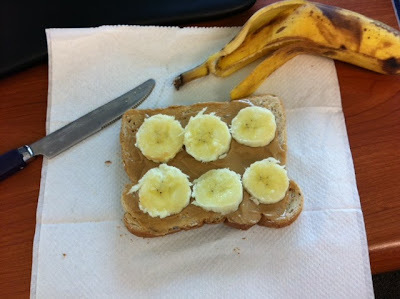 I sliced up half of the banana and put it on the toast and peanut butter and ate the other half on its own. TGIF bloggies. Have a great day and I will see you in a bit!